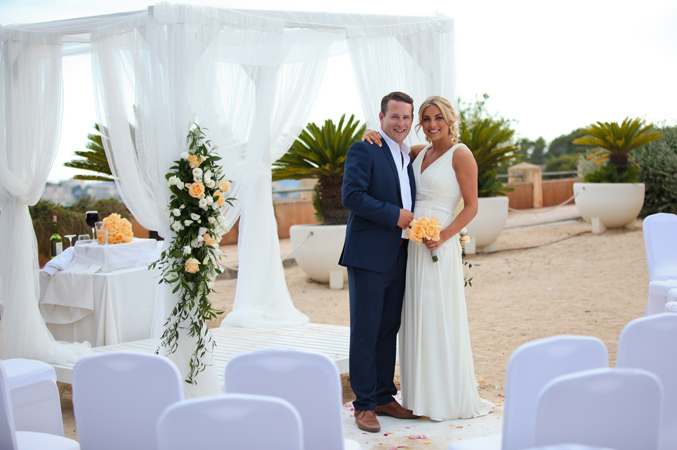 Carly & Matt dreamt of getting married in Majorca after having visited the island on a number of occasions holidaying with their family. Sunshine Weddings Spain received a call from a work colleague of Carly’s, and friend of Lisa’s, explaining the couple needed help in discovering if their dream wedding in Majorca would ever be at all possible. They flew over and met with Tor, who showed them a number of beach wedding venues in Majorca. They chose a stunning beach club, which they took exclusively, for their guests to experience the breathtaking views of the Mediterranean Sea and the romance and sophistication of the beach club itself to have a fun filled party, which really was the main feel of their celebrations and which complimented both Matt & Carly’s personalities! To welcome their friends and family to their wedding in Majorca, and so everyone could get to know each other, Carly & Matt put on a fantastic BBQ buffer dinner at a beach club restaurant near to where everyone was staying. All the wedding guests took in the gorgeous views as the sun set over the sea and instantly relaxed & began to get excited about the next few days of wedding celebrations that lay ahead of them. Carly & Matt’s wedding day in Majorca finally arrived and the wedding party gathered on the private beach area at 7pm where the ceremony took place over looking the Mediterranean Sea. The wedding procession started with Carly & Matt’s parents firstly walking down the white carpet, which lead the way to their private beach wedding in Majorca. Followed by her bridesmaid, and sister, and then niece who scattered flowers to lay the way for the bride’s entrance. Carly looked stunning floating down the aisle like a beautiful goddess to Shania Twain to meet Matt under the Chuppa to become Mrs Cooper. After the ceremony the wedding party left the beach and were lead to the surprise beach club venue, which was dressed with the venues crystal centrepieces, candles and beach shells to compliment their beach wedding feel. The wedding guests were served cocktails & canapés before being seated for the wedding banquet on the terrace over looking the pool with chic white sofas and loungers. The bridal couple organised some fabulous music, both during the ceremony with Andre on piano, and also for the typical Israeli dancing that is traditional with a Jewish wedding. With their fun wedding theme the couple had dancing in between dinner courses lead by Charles Ralph a fantastic singer, accompanied by a Saxophone player all adding to this amazing wedding in Majorca. By the time everyone had finished eating and the speeches had taken place, the party was in full swing and soon moved to the ready-made discotheque part of the beach club itself. The party went on till 2.30 am when the grand finale took place where our fun bride made a quick change into a glam swim suit with the printed words “Mrs Cooper”, and made her entrance by jumping in the pool along with a number of the wedding party who had all packed their swimsuits ready for the occasion. Carly and Matt’s dreams of getting married in Majorca had finally come true, and by adding their very own style of “fun in the sun” to their wedding celebrations, created a lifetime full of memories for all their friends and family to take home to remember their very special wedding in Majorca.